The ‘magic carpet’ conveyor lift will whisk you comfortably to the top of the hill – from there, gravity takes you to the bottom! With up to six 800-foot tubing lanes and an expanded fleet of tubes, you’ll spend more time sliding and less time waiting in line. Tubing lanes are sculpted into mini half-pipes. The slope angles are all a little different to keep the ride fun and fresh and adapt to different snow speeds. A delightful loop for first-time or experienced trekkers looking for a little person-powered recreation. Come enjoy this five-kilometer groomed trail for FREE! This trail is unique because there is no fee to use the loop. The Activity Barn loop connects to the North Valley Rail Trail, so the options are limitless! Dogs are welcome. Please be considerate of all user types and ‘share the road’. 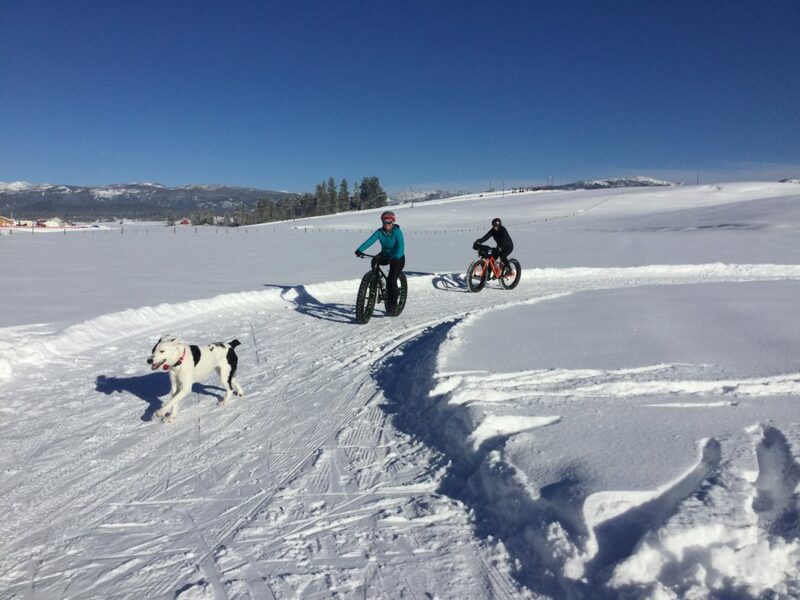 NEW THIS YEAR: Fat Bike Rentals are available on site! 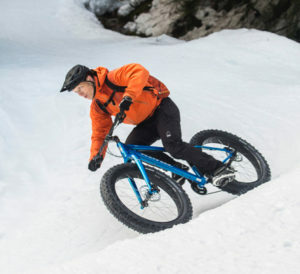 Hit the trails on a brand new 2019 Kona Wo bike. $25 for a two-hour rental. This pass is for all ages and valid for unlimited conveyor lift and tubing access any operating day during the 18-19 Winter Season. Show your Brundage Mountain season pass or same-day lift ticket and get $2 off any two-hour tubing session. The Activity Barn is proud to host enriching activities and special events to help kids embrace the outdoors. Closing Day was March 31. Thanks for a great season! The Activity Barn is located South of McCall off of Moonridge Road. Just after entering McCall city limits on Highway 55, turn left at the stoplight on Deinhard Lane. Continue on Deinhard half a mile to Mission Street. Take a left (south) on Mission. Continue south for 1.6 miles until you reach Moonridge Road. Take a right on Moonridge and continue .6 miles. The Activity Barn is on your left. Please watch for pedestrians and cross-country skiers as you approach. Go south on Highway 55 to the stoplight at Deinhard Lane. Take a right (west) on Deinhard and go half a mile to Mission Street. Take a left (south) on Mission. Continue south for 1.6 miles until you reach Moonridge Road. Take a right on Moonridge and continue .6 miles. The Activity Barn is on your left. Please watch for pedestrians and cross-country skiers as you approach. Drive on Highway 55 to the stoplight at Mission Street. Turn right on Mission and continue south for 2.4 miles until you reach Moonridge Road. Take a right (west) on Moonridge and continue .6 miles. The Activity Barn is on your left. Please watch for pedestrians as you approach. Groups can plan ahead by contacting The Activity Barn at [email protected] or by calling 208-634-3298. Group pricing is available with 24-hour advance reservation. Groups are defined as 30 guests minimum. $550 minimum for 2-hours of tubing for up to 40 people. Additional guests above 40 people at $13/guest. Reservations must be made and confirmed at least 7 days in advance. Food & Beverage is available and must be ordered in advance. Winter birthday parties are fun, active, and hassle-free! Each party is welcome to bring one birthday cake, no other outside food and beverage is allowed. Any additional food and beverage can be purchased through the Bruno’s Snack Shack at the Activity Barn. Birthday party bookings are available on Fridays and Sundays during regular hours of operation. 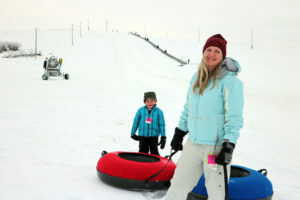 Children must be 4 or older to snow tube at the Activity Barn. Please bring enough adults to appropriately supervise your group. Each child will need a liability release signed by a parent or legal guardian in order to snow tube. Liability releases are available here for parents to sign on line in advance. Children must be at least 36″ tall and able to pull their own tube. All children should be accompanied by an adult. This is important, as most children will need assistance at the bottom of the hill – getting out of the tube, walking safely and in a timely manner away from the lanes, and in the right direction of the tube lift. Our magic carpet will take you up the hill effortlessly, just place your feet hip width apart and hold on to the handle of your tube. Once our trained staff has directed you off the lift at the top of the hill it is smooth sailing! Our energetic staff will send you off safely. No experience is needed, just hop in your tube and enjoy the ride. If your child will be tubing under the supervision of another adult, you’ll want to fill out their liability form in advance using our online system. Our tubes are 41” wide on the outside and 20” wide on the inside and are designed for one (1) single rider. Under the appropriate surface conditions, we do allow several tubes to “link” together. For children 6 and under, one (1) parent will be allowed to tube with their child while holding the handle of their child’s tube. (NOTE: The parent should be in the lead tube and the child behind for appropriate safety measures). May I bring my own sled or tube? You should dress for snow with waterproof clothing. Warm clothing including long underwear, gloves or mittens, hat or headband, jacket and ski/snow pants should be worn. Goggles are always a good idea as well. If you forgot any clothing items, there are gloves, hats, goggles and handwarmers available for sale in the ticket office. Helmets are not required, but it’s never a bad idea to wear one. As with any winter activity, there is a chance for injury. For safety purposes, the tubing employee will inform you when it is safe to start tubing—which is after the tubing lane is clear. Exit the tubing lane in a timely manner so the tuber behind you can be on their way down the hill. Remember, attendants are there to help you. The wait depends on the day’s attendance. 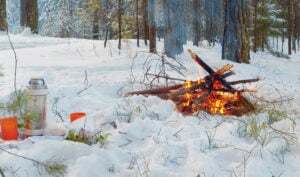 You can check our website under current conditions where we will post daily about both snow conditions and whether or not we have any large groups scheduled for the day. Currently, we do not limit the amount of tubing sessions on the hill. We advise that folks consider what they want out of their tubing experience if they see large crowds on the hill. If you want to enjoy the energy and fun that a large group provides, we welcome you to join in. If it is extremely busy, we do ask customers to share tubes by passing them up the line of customers waiting to get on the lift. As you get closer to the loading, a tube will be passed to you. If this doesn’t sound like your kind of gig, we tend to be less busy on Fridays and Sundays. Our heated event tent, new in 2016, is a wonderful place to sit down and warm up and enjoy street tacos, chili or a yummy snack. We also offer coffee, tea, hot chocolate, and soda. No, no reservation is required. Our ticketing system allows you to choose when to show up and we’ll start your time 10 minutes from the purchase of your ticket. This handy little grace period allows for you to get bundled up, grab your tube and be on your way to fun. Who Qualifies for a Military Ticket? To qualify for Military Pricing, you must show active or retired military ID. DD-214 forms will be accepted in lieu of ID cards. Discount does not apply to dependents. How do I plan a group outing at the Activity Barn? Groups can plan ahead by contacting The Activity Barn at [email protected] or by calling 208-634-3298. Group rates are available for groups of 30 or more. Each member of your group can save time by filling out your liability form online prior to arrival. Are pets allowed at the Activity Barn? As much as we love animals, we do not allow any pets around the area. If you bring pets, we ask that you leave them in the car, both for the safety of your beloved Fido and for all of our guests as well. You can SAVE TIME by filling out your liability form online. The Activity Barn is now closed for the season.